Monday night saw an exciting-as-hell throwback to a different time for college basketball: the two best teams in the country facing off, each led by a senior. 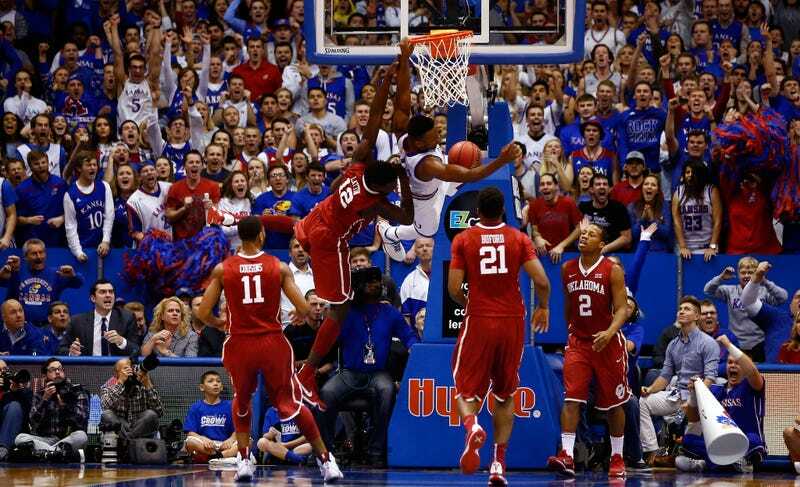 In the end, Perry Ellis (27 points, 13 rebounds) and #1 Kansas topped Buddy Hield (46 points, 8 rebounds, 7 assists) and #2 Oklahoma, 109-106 in triple overtime. After a seesaw opening five minutes, Kansas took the lead and extended it to eight midway through the half, before Oklahoma stormed back to go on top 44-40 leading into the half. Oklahoma kept that lead and was up eight as late as 13 minutes into the second half, before Devonte’ Graham, Wayne Selden Jr., and finally Ellis combined to tie the game up. The game easily could have, and probably should have, ended in regulation. With just three second remaining, Kansas forward Landen Lucas went over the back of Oklahoma forward Khadeem Lattin’s fighting for an offensive rebound, sending Lattin to the line with a one-to-one. But Lattin, a 52% free throw shooter, missed, and the game went to overtime. Oklahoma took a five-point lead on Hield’s three-pointer in the first overtime, but Graham and Ellis brought Kansas back, and neither team could pull away in the final minute. Kansas had the best look when Selden Jr. somehow got wide open on an out-of-bounds play with under three seconds, but he missed his three. The second overtime was a sloppy, unmemorable affair. After Lucas tipped in a shot with 3:20 left to tie the game up, the two teams combined to brick their final eight shots. Finally, in the third overtime, something gave: Oklahoma’s precision and passing. Kansas took a four-point lead, but an insane Hield three helped lead to Oklahoma taking a two-point lead, as well as possession of the ball. But with 47 seconds left a Lattin travel led to a Mason Jr. free throw, followed by Mason Jr. picking Hield’s pocket and Graham sinking two free throws. Now down one with just 12 seconds on the clock, Oklahoma took a timeout ... and had the ball stolen on the subsequent inbounds. Mason Jr. made two more free throws, and Hield’s desperation three-pointer—after Kansas almost had another steal—missed. The rematch between these two teams is on February 13, in Norman. I highly suggest you tune in.